T-Club launch a T-riffic success! This month we launched our fantastic new social group, T-Club. 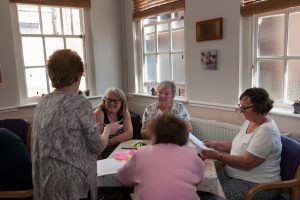 Meeting every third Tuesday of the month in Dial House Café, our monthly social group is for those aged 50 and above, where the T stands for Tea, Tunes, Technology and most importantly, Togetherness. 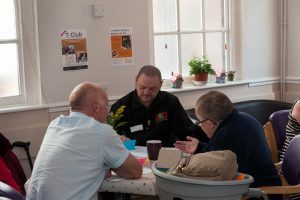 Our maiden session was a free afternoon tea at Dial House Café teamed with brainstorming to gather the ideas of the group about what they would like to be doing during T-Club sessions. There was a huge turnout for the launch, with around twenty five people there to share ideas and they certainly were forthcoming! We had some really great ideas thrown into the ring including a film afternoon, day trips to Llandudno or the zoo, craft afternoons, quizzes and movement classes. Of course in exchange for everyone’s fantastic ideas, they were treated to a delicious afternoon tea provided by Dial West Cheshire’s Community Café. Our dedicated team of volunteers had a great time looking through everyone’s ideas and have decided that our next session on Tuesday 19th June at 3.15pm will be a Quiz with prizes up for grabs! Entry will be £2 and will include light refreshments. We are still also looking for volunteers to help organise and run sessions, if you think you would like to be involved and would like to learn more, please contact us here.